Like a lot of what rank and file Googler’s say, this is an example of bleating the mothership message, without either fully understanding, or simply being disingenuous. 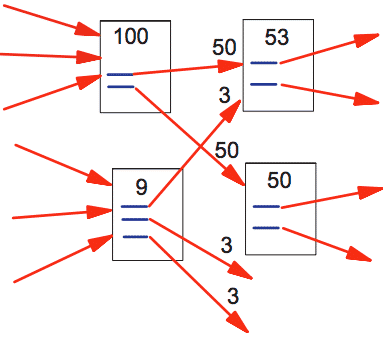 In this example the page in the top left has 100 ‘arbitrary PageRank’ points and two outlinks. The PageRank is divided equally between those two links. The page on the bottom left has 9 ‘arbitrary PageRank’ points, and three outgoing links, again you can see that score is divided equally between them. As the page in the top right receives one link from each of those pages, it receives (100/2)+(9/3)=53 points. The page on the bottom right only has one link from the top left, therefore has 50 points. In reality, it wasn’t that simple as the location of the link on the page impacted the PageRank passed through (logic dictates that links hidden in the bottom right of the footer are less important than a navigational link, or a prominent in-content link. But What About the Sculpting? When the nofollow attribute was introduced it was to counter comment spam predominantly – and in its original incarnation it simply ignored the allocation of PageRank to the tagged link. An important distinction here is that google still “follow” the link, but they assign no weight to it either in anchor text attribution or PageRank equity. In the example above, imagine that the first link on the top right is no-followed, 100% of the PageRank would flow through the second link, meaning that the 100 points would go to the page on the bottom right. Back in June 2009 (AKA the paleolithic period of SEO history) Matt Cutts announced that Google had made a change, and were no longer applying “increased” PageRank to the remaining links, they were simply discounting the amount that would have passed through that specific link. Essentially you were sacrificing that PageRank equity. It disappeared. Ceased to exist. Vanished. Pooooomf. Alright, so how do I it Then? This is a subject we tackled in the aftermath of the original announcement 6+ years ago. As happens a lot in SEO, the perfect solution works for both search engine crawlers and human beings: Reduce your on page links as far as you can within the parameters of User Experience and Information Architecture. How Many of These Links do you REALLY Need? Thats 11 links I’ve just listed, all of which you could combine into one intermediate page that links to each of those. Guess what, if your page had 100 links to begin with, you’ve just increased the total PageRank flow to the remaining pages by a cool 10%. In PageRank distribution, that mantra really is the case. The less links you have on any given page, the higher the percentage of strength flows through the remaining links. In short, you’re not diluting them with links that don’t need to be there. How do I Decide What to Remove? If the target page fails that sense check, dont link to it. Period. For the record, its a similar mindset that I approach site structure & Panda/thin content issues, but thats a side point. Take a look at your site, analyze each and every link on each of your site templates. Be ruthless. Trim the fat as much as possible, remove every link to pages that you possibly can where the target is considered to be of low search value. Even if you’ve done this before, its a good idea to revisit it every couple of months, as Product and Merchandising people often work with the opposite mindset – where “more is more”. I’d love to hear your site structure hints and tips in the comments section! Spot on. Loads of people don’t look beyond nofollow as a way to sculpt and forget that it is more about the reduction in distractions etc. and controlling you IA. Old school is the best school. Solid post and agreed that limiting links is a great approach. For the example you provided with the 11 links, how would you recommend condensing those 11 links to 1 other page? What would the 1 link anchor text say? My only concern is, as no doubt the overwhelming majority of SEO practitioners these days were not in the industry back in ’09, they may not have considered this at all! Specifically in the mockup I put in the post, I’d split that into two pages, the obvious one being social, so “Connect with us on Social” then linking to a landing page with proper details on each of the companies profiles (seeing as you now have a lot more screen real estate you can do cool stuff like pulling in the most recent tweet/facebook post etc). That way you’re not sacrificing the user experience, but you are funneling them all into one page. Again, same as above, now that you’re pushing people into a new page, you have a lot more screen real estate to do cool stuff with that content, rather than just those links in your footer! I completely agree, but most of the if you work in a big company you’ll hear UX people saying it can’t be done because adding 1 clic decreases the user experience. I typically disagree with it but it’s hard to find a compromise sometimes. Hey Giuseppe, quick question – you done any JS link equity testing recently? I’ve read it no longer works, but haven’t tried it myself otherwise I would have brought it up above in the post. I thinks it would still make sense to test adding links for users only after the DOM has been loaded. Was a bit disappointed this wasn’t an experiment in old school PageRank sculpting with nofollow, but good post none the less. I’m not even sure it would be possible to test the old school way now that I think about it. Martin what are your thoughts on leaving the links there (keeping UX people and those that just don’t get it happy) but noindexing the pages they lead to. In theory the PR then just flows on its journey through the nav and such. Hi Martin, would also be interested to hear if Jon’s idea is a good one (concerned about UX). Or does it go against What Cutts was saying and that we should be looking at removing those minor links and adding them to an intermediate page for an all-round better architecture, and ultimate UX. 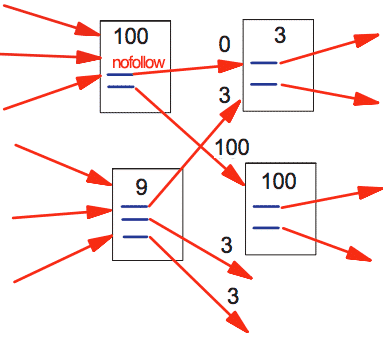 “Q: Does this mean “PageRank sculpting” (trying to change how PageRank flows within your site using e.g. nofollow) is a bad idea? Wondering if anyone here can answer this question. Do multiple links to a single page count as multiple links that subtract from PageRank? For example, I have a Top 5 things to See list on a webpage and each of the Top 5 items has it’s own content chunk that contains a title of the thing to see (linked to thingToSee1.htm) and a “More Info” link under the short description (linked to thingToSee1.htm) and a small thumbnail image to the left of the title and description to show the visitor what the thing is graphically (also linked to thingToSee1.htm). So you can see that in this example on a single page I have 3 separate links to a single webpage – all to make it easier for the user to be able to click through to see the “thing to see”. That is 3 links. Do 3 links on different elements to a single page reduce from overall page rank of other links on the page? Or do all 3 count as a single link to follow, thereby only reducing overall Page Rank for other links by a total of 1 since they all go to the same page? I was thinking Page Rank is over! I’ve always done this and was surprised when someone said I was PageRank sculpting a few months ago. It isn’t PageRank sculpting (which I see as being the old nofollow approach), it’s common sense. In addition – re-ordering because of Reasonable Surfer. Theory would say that pointing the links at a noindex,follow page would pass PageRank through unfiltered to the destination links of the second page, in the same way as if it were indexed normally. The problem being it wouldnt positively impact the remaining links on the page by its re-inclusion (if that makes sense). Sculpting had been demonstrated to work extremely well, enterprise site link structure work operates under the same theory – so denying it works just doesn’t hold water imo. Let me put it this way, when you want to focus PageRank on specific products, you reduce the links to other products from the same page. That’s PR flow 101, and this really isnt any different at all, its just applying the theory sitewide rather than situationally. Hey Jane – thanks for commenting & sorry for the delay in replying, I manually accept every new commenter & yours was in the spam queue sorry! Its been a LONG time since I’ve seen data to back this up, but the accepted theory is that multiple links per page don’t increase the percentage of flow to that specific destination. Therefore the pagerank is divided between destination pages as a group, not divided by total outbound links then applied to the target site. There’s some obvious reasons why Google wouldn’t allow it the other way – specifically we’d all have a hundred links to our most important pages everywhere! It also reminds me of the google analytics on page overlay, that cant distinguish between links on page that point at the same URL either. Google not wanting you to focus on close detail is primarily because doing so allows you to adapt your site to them. They spend their days trying to sort which sites are the best results, when we start gaming the algo you might argue we are then working at odds with each other. Their default advice of “produce great content” really fulfills their need to index great content, than any consumer friendly altruism. Wouldn’t it just take care of itself? Each link could get PR but because there are more links they’ll get less. But the sum of the PR received would be the same as if there was one links. Maths innit. Anchor text-wise though Jane it’s only the first link that passes the text (or used to be). Thanks for your reply. I’ve read the last but a few times but I don’t get it sorry! Can you rephrase? Sorting out the comment threading issue…. THANKS for pointing it out, I only reply on the backend so hadnt noticed! What you are suggesting is perfectly acceptable, and it does address removing the pages of low search value from anything where it might rank unintentionally. What it does not solve however, is the magnification of PageRank onto the remaining links. For example, you have 10 links on a page, each gets “10” pagerank points, if you remove 5 of those links, the remainder get “20 PageRank points” each. In your model, if you noindex 5 of the destinations URLS, then those 10 links on the page STILL share the PageRank evenly and therefore only get 10 points. In the other model, where you consolidate those into one link, the rest benefit by virtue of less competition for PageRank. Understood! Yeah in my model the PR isn’t wasted as such, but it’s not funnelled to where it could be used most which I guess was the original point of your post!